How to Turn Off Your Inner Critic | Blog It Back! Can gratitude sanitize OCD? You betcha! Count your blessings and discover how the words of gratitude come to be a feeling that warmly washes over you. Sound too good to be true? The benefits of gratitude are scientifically proven! Practicing gratitude is highly effective if you want to turn off your inner critic. Decontaminate OCD’s sharp tongue by finding the silver lining. 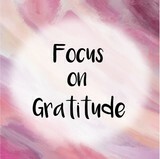 When you speak gratitude, you get energized and gain the courage to face anything OCD throws at you. With an OCD sideshow running all the time, practicing gratitude isn’t easy to do. Once you get the hang of it though, in just a few minutes you can disinfect the negativity. By reflecting on your abundance and shifting your focus away from what you lack, you’ll soar above your worst worries! Once you’ve worked gratitude into your daily routine, you’ll start to notice that your inner critic is much less stressed. When you have finally let it sink into your subconscious mind that you have many blessings, your stress will start to slip away. OCD loses its grip on you. How Grateful Are You? Take the Gratitude Test! I am grateful for all the activities of daily living I am able to perform. I scan my body and am grateful for the parts that function and help me throughout the day. I am continually amazed that my circumstances don’t stop me from giving love! No matter what is going on inside my mind or world, I am always capable of showing love. I overcome, I grow, and I prosper all the time. My abundant blessings, as well as my difficulties, make me better, stronger, and more alive. There is no destination. I choose to grow as I take this journey. I am so grateful that I GET to take out the garbage. I GET to go to work. I GET to go to school. I GET to have life experiences. I appreciate and show my sincerest gratitude to my loved ones. Once a day I tell at least one person how they are loved, unique and important. The universe is looking out for me. There may be trials and tribulations, but I am never alone. OCD is a strangely wrapped gift. For [this], I am exceptionally thankful. I am so amazed by the tiniest of creations. Just look at how this little inchworm moves or how this tiny ant carries a heavy leaf. I give thanks for all the abundance that is yet to be revealed to my friends and family. I wish them the strength to endure and the courage to explore. I am grateful for the experience that caused me to forgive someone. Spending some time expressing gratitude is one of the most natural “stress relief drugs” you’ll ever take. Gratitude comes with no ill side effects, and it’s free. Giving thanks is user-friendly. It’s also portable–it goes wherever you go. Journaling about things for which to be grateful. Thinking about someone for whom you are grateful. Writing/sending a letter to someone for whom you are grateful. Undertaking the “Count Your Blessings” exercise. I’m grateful for the encouragement in this blog. Thank you for writing this, it means a lot to me!